When one does more research, they find that there are a multitude of names of places and people–even names of kings–that have meanings that center around God. These names begin with Jeho in English (Yeho in Hebrew) and some even include God’s whole name: Jehovah. One last thing—in the KJV, God is referred to as ‘Jah’. This is a CONTRACTION. When you have a contraction, you have taken letters out of the middle. To wit: J ehov ah  Jah. Newer versions incorrectly translate this as ‘Yah’ because they have CHANGED the J (Hebrew ‘Jod’) to a Y!! This is part of their plan, to change the Tetragrammaton, in order to attempt to change God’s name to Yahweh in the newer (corrupt) Bible translation. To see what the Hebrew alphabet really is, look at the section headings of Psalms 119 in an AUTHORIZED King James Bible. 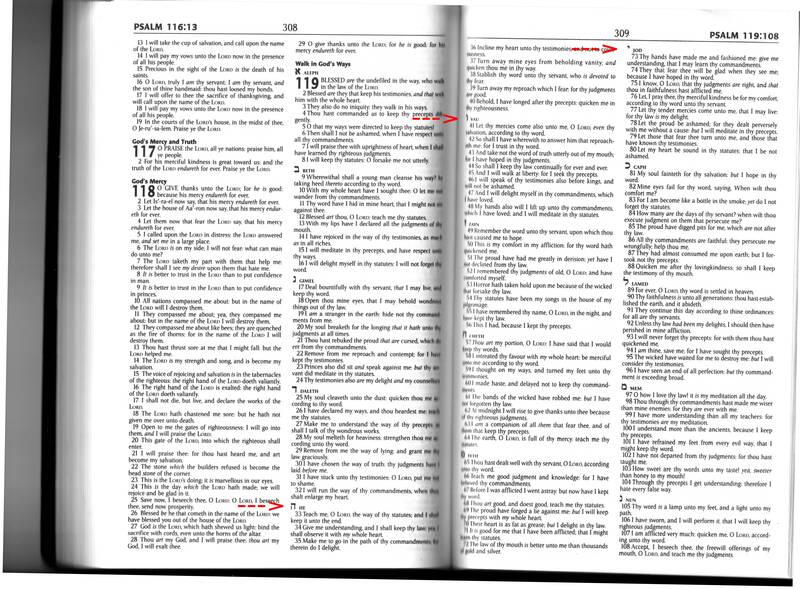 Psalm 119 in Authorized King James Bible–notice the Hebrew alphabet letters: JHVH (Jod He Vau He) NOT YHWH!! Translation: Jehovah is the greatest!! Friends, God did not create the Sabbath (for the Israelites) when He gave Moses the Ten Commandments. He CREATED the Sabbath on the seventh day of creation!! The Sabbath was a holy day all the way back to Adam and Eve! (1) To bless something is the opposite of cursing it. (2) To sanctify something is to set it apart as sacred, consecrated, and holy. The Sabbath has always been, and always will be*, a holy, set-apart day. WE do not MAKE the Sabbath through our choice to keep it. It already exists and is holy, apart from us and our actions. It is a day that God has declared, FROM THE BEGINNING, to be holy and set apart for Him. Therefore, if we choose NOT to recognize and honor it, then we are guilty of PROFANING the Sabbath. The Fourth Commandment does not tell us to MAKE the seventh day the Sabbath. Instead, it tells us to REMEMBER the Sabbath (which was already in existence) and to KEEP it holy (as God already made it holy, in the beginning). The Sabbath is the day that God has appointed to meet with His people–it is a holy appointment (convocation) that He has declared. This does not mean that you must attend ‘church’ on Saturday!! The practice of the early Church was to meet on Saturday nights, which according to their calendar was the beginning of the first day of the week (‘later called Sunday’–a new day began at sundown). They met to fellowship and encourage one another, as well as to study God’s word. The Sabbath, on the other hand, is about you resting and meeting with God. You can meet with God together WITH other Christians on the Sabbath if you choose, but the focus is to be on Him–not so much on one another. Knowing what you know now, and with the added conviction of the Holy Spirit, if you continue to ‘do your own pleasure’ on the Sabbath, it reveals that you are not fully submitting yourself to God. Many of you will say–‘but I must work on the Sabbath’! I understand that for many of you that is a difficult situation. However, we must obey God rather than men. You cannot serve both God and Mammon (money). You display a serious lack of faith in God when you put your trust in money and willingly disobey God to ‘keep your job’. If your faith in money (your job) causes you to disobey God, then who is really your Lord: God or Mammon? Find a different job if you must–God will surely provide for you as you act in obedience to Him! ‘For as the new heavens and the new earth, which I will make, shall remain before me, saith the LORD, so shall your seed and your name remain. And it shall come to pass, that from one new moon to another, and from one SABBATH to another, shall all flesh COME TO WORSHIP before me, saith the LORD. Please note: this author in no way recognizes, supports, or condones the Seventh Day Adventists or Hebrew Roots movement. For those of you who are confused about this ‘correct name of God’ stuff, and have doubts about whether God’s name is Jehovah, because of lies put forth by deceivers . . . this should confirm, once and for all, that His name IS Jehovah . . . Surely there exists concrete archeological evidence of the different kings whose names began with ‘Jeho’ and had meanings such as ‘Jehovah is exalted’. Or Joseph . . . is there any question that one of the sons of Jacob/Israel was named Joseph? ETC. These are just a few of the names in the Bible based on a reference to God. They confirm, at least, that the first four letters of God’s name (in Hebrew) are ‘Yeho’ (YH) . . . in English, ‘Jeho’. This ‘Sacred Names’ stuff is NOT a movement within Christianity. It is an infiltration OF Christianity BY witchcraft. Here are a couple of very recent, good videos on this subject. This heresy is spreading rapidly and we need to know how to correctly respond. Who In The World Are You Talking About? God’s name is not ‘Yahweh’! You are being led astray!! Every place in your KJV Bible that you see LORD, or GOD, (in all caps) it is the Hebrew name Yehovah, which in English is pronounced ‘Jehovah’. You will find this name 6,519 times in your Bible! A variation (Yehovih) is found 305 times. ‘Yahweh’ is not in your Bible once. Don’t believe me? Check it out for yourself. I strongly suspect ‘Yahweh’ is just another name for the moon God that was worshiped in the land of Canaan (and now goes by the name ‘Allah’ among the Muslims). Lucifer has MANY names. Even one he wants Christians to call him: Yahweh. Lucifer is all about precision in form and ritual (think witch’s potions, incantations, specific dates and times, etc.). Jehovah wants men to call on Him in spirit and in truth. He can discern our hearts. He knows when we are calling out to Him, even if we WERE to get His name wrong. Don’t get caught up in the false, fear-based, ‘sacred names’ movement.